The president did not have to defer to the union leader; FDR had the support of labor. Roosevelt respected Hillman’s perspective on matters that extended far beyond the shop floor. He relished Hillman’s vision of a “social unionism” that sought to address economic challenges and to build strong communities (and which saw the ACWA start a bank, develop housing cooperatives, and invest in research that helped define a consumer movement). At the heart of the relationship was recognition on the part of FDR and top Democrats that union leaders had more to offer than counsel on industrial relations. “Labor statesmen” like Hillman and Brotherhood of Sleeping Car Porters president A. Philip Randolph were brought into discussions about civil rights, women’s rights, and strategies that would respond to the Great Depression and the fight against fascism. It is not just an issue with the DNC. Both parties, and most of our political and media elites, frequently fail to respect the depth and breadth of the insights that union leaders and activists bring to debates about the issues facing America. While business leaders comment on everything—and even run for president—labor leaders are rarely recognized as the experts and advocates that they are. Even allies of the labor movement often miss opportunities to fully utilize that expertise. Concerns about the DNC’s approach arose after Bernie Sanders said while campaigning in California, “What we heard from the DNC was they did not want representatives of labor unions on the platform drafting committee.” National Nurses United Executive Director RoseAnn DeMoro, one of the most outspoken members of the AFL-CIO Executive Council and a frequent critic of the DNC leadership, had expected to join the 15-member drafting committee as a Sanders pick. But when the DNC released the drafting-committee roster, it featured no presidents or directors of major labor unions; although veteran labor strategist Paul Booth, of the American Federation of State, County, and Municipal Employees, was included at the request of Democratic front-runner Hillary Clinton. Booth, a serious thinker and activist on behalf of working people, will have allies on the drafting committee. Congressional Progressive Caucus co-chair Keith Ellison of Minnesota (a Sanders pick), Congressman Luis Gutiérrez of Illinois (a Clinton pick), Congresswoman Barbara Lee of California (who was included by DNC chair Debbie Wasserman Schultz), and drafting committee chair Elijah Cummings, a highly regarded congressman from Maryland, are all friends of labor. In addition, the full platform committee (which will debate and potentially amend the drafted document) includes leaders of three unions that gave early support to Clinton: American Federation of Teachers president Randi Weingarten (a lawyer and former classroom teacher who has been in the forefront of struggles to strengthen urban schools and who has raised the alarm about a “fixation on testing and data over everything else”), Service Employees International Union president Mary Kay Henry (a key figure in the “Fight for $15” struggle who has been named as one of the 100 most creative leaders by Fast Company magazine), and AFSCME president Lee Saunders (a labor economist who has worked with the Leadership Conference on Civil and Human Rights). Labor will have a voice in the platform process. But this misses the point about what union leaders and union activists bring to the broader debate. At a point when many of the concerns that labor unions have been raising for decades—about income inequality, wage stagnation, failed trade policies, deindustrialization, automation, and the fair treatment of all workers—are at the center of the national debate, Democrats should be turning to labor leaders for counsel on a wide range of policy questions. 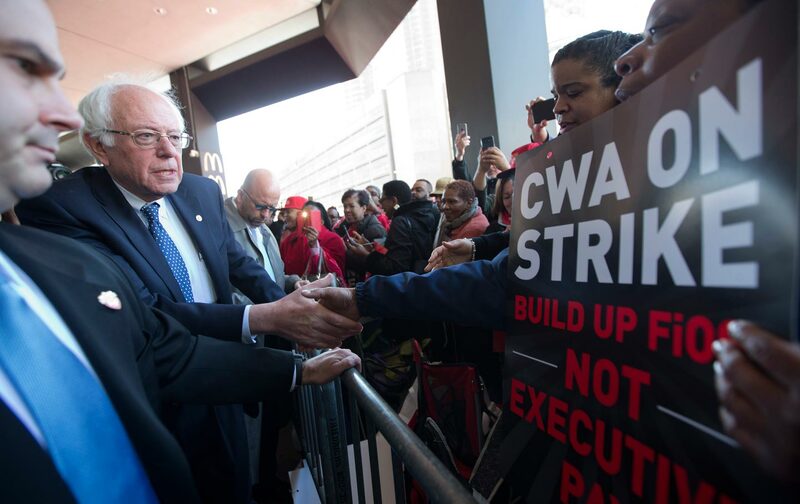 This is smart politics, as it helps to counter the appeals of Republican Donald Trump to working families; but it is also smart policy-making, as unions leaders really do know the issues. Larry Hanley, the president of the Amalgamated Transit Union, is an expert on transportation policy and on how investments in public transportation help to address climate change. Laborers’ International Union of North America President Terry O’Sullivan has for years championed investments in infrastructure, while International Federation of Professional and Technical Engineers president Greg Junemann leads a union that has advocated for developing and protecting the infrastructure that guarantees safe water—no small matter as Americans react with horror to conditions in Flint, Michigan. AFL-CIO Executive Vice President Tefere Gebre, who came to the United States as a teenage refugee, is a brilliant advocate for immigration reform and a bold defender of victims of economic exploitation in the United States and internationally. Farm Labor Organizing Committee President Baldemar Velásquez has wide experience with immigration issues and he is a brilliant commentator on food—so much so that he was named a MacArthur (“Genius Grant”) Fellow. The list goes on and on. And it certainly includes DeMoro, who has been a leading advocate for healthcare reform, as a campaigner for a single-payer “Medicare for All” system, and for pioneering safe patient-ratio guarantees that provide for safe staffing for RNs and patients at hospitals. But her advocacy has also extended to addressing the financial crisis and proposing fresh ideas to counter austerity. Labor leaders—those who have endorsed Clinton, those who have endorsed Sanders and those who have endorsed no one at all—bring a vital vision to policy debates about industrial relations and much, much more. That vision is every bit as relevant today as it was when New Deal Democrats and their union allies were on the march.